Less of Paige: My legs hurt! I have two things to tell you about: Yoga for Weight Loss and The Firm. On Wednesday night I took a yoga for weight loss class. I was hoping it would be closer to Power Yoga than it actually was, but that's ok. We all had our mats in a circle, which was different for me. Natalie, the instructor, started off the class by talking about her own stuff regarding weight and food and then asked us to go in a circle, introduce ourselves, and talk about "what's on top" (whatever's going on with you right then). So everyone introduced themselves and some gave a brief history on their weight issues (why is it that there's always a history with this stuff? So sad.) and some just said why they were taking the class etc. I'm pretty sure I said, "Hi I'm Paige and I hate any kind of exercise besided yoga. I thought this class would be perfect.". And it was. Not because it was some great cardio workout, or because I really felt challenged physically. I didn't. It was basic and I've learned that I'm actually beyond basic in yoga. It was perfect because I felt like I was in a group of women who understood. Where I didn't have to compare myself, I didn't have to try. I was in a community of women dealing with the same stuff I deal with. And there were some insights that I learned, and that was great too. Natalie made the comment at some point that what we complain most about is what we are actually attached to and have some kind of blockage in releasing. And that it's important to release those things. I 100% agree. I think that for the things that are most difficult or that we whine about, there is something there for us. Something that keeps that cross in our lives. I know that I whine and moan and complain about my weight. But it's always there. And there are some pieces of me that wonder what I will be like if I lose weight. Will people not bother getting to know me anymore, because they don't have to like they do now? Will my husband still be attracted to me- I don't doubt he'll still love me, but will he still want me? What will I look like? Maybe I'd be ugly under all this fat. Those are the real honest truths, and probably the core of why it's difficult to lose weight. I think I've finally hit my stride, but the weight is not just falling off right now. And every other time, in the past, I've given up. Additionally, I'm in denial. I don't want to accept that this is going to be with me for the rest of my life. I have an addiction to, a problem with food. And I don't have the kind of body that can handle that. I eat, I gain. Bottom line. I don't have the high metabolism of the people that can eat whatever they want whenever they want and not gain weight. I have to, at some point, accept that I will have to watch what I eat for the rest of my life if I don't want to be fat forever, and keep getting fatter. It's certainly thoughts to chew on. No pun intended. I did the Firm this morning- Maximum Cardio Burn plus Abs. Someone I'm really close with who also struggles with weight told me that this was the only video she ever did that made her see body-changing results (the Firm, not necessarily this specific one). So I thought I'd try it. If I don't see results from that workout, I'm hopelessly doomed. It was great. It was like when I used to take step classes, which I also loved. (that and yoga.) It was hard and I was dripping sweat. But there was not alot of talking (unlike Miss Carmen) and there was alot of working out. Someone warned me that the videos are a bit stepford-wivesish, and they are. The girls have these strange smiles pasted on their faces, which I didn't understand because, Hello? We're working out here?!?! Maybe I was the only one that was dripping sweat and didn't feel like working out. But it really felt great. At some point I have to return the video to Netflix, but I think I'm giong to go to Target or Walmart and find some new videos. And I'll have to invest in a more stable stepstool. The one I have kept falling over. Oh! 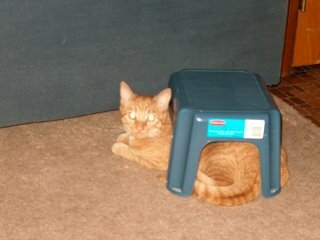 Speaking of the stepstool- it's a small one, and the cat thinks that it's her own fort. She's always under it. Well, while I was working out was no exception. I had to step on the thing and watch out for her when I stepped off, because she's almost a year old and doesn't fit completely under it, even though she thinks she does. She just loves helping me work out.